Water releases slowly from a 5-gallon bucket, thoroughly watering the roots of a small shrubs and young plantings. 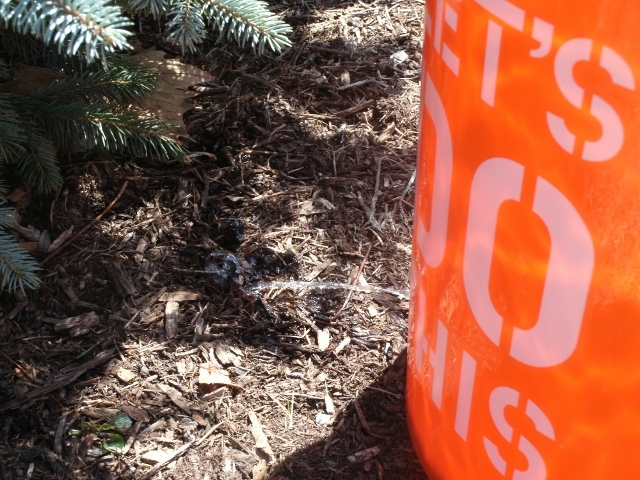 Here’s a neat tip I’m trying this year for watering smaller shrubs: Drill a 1/8 inch hole in a 5-gallon bucket, fill said bucket with water and resume your gardening. I have struggled with estimating how much water to give my young-ish shrubs. I saw this tip in Garden Gate magazine and thought I would give it a try. The water comes out s-l-o-w-l-y from the bucket, targeting the plant roots with moisture, which is the goal. As an impatient gardener, I am learning that steady and slow means happy, healthy shrubs. It can take nearly an hour to drain the bucket, delivering the water just where I want it. As the bucket drains, I move it around the plant to ensure all sides are covered. Bonus: I’m no longer trying to guestimate how much water the soaker hose is delivering. I’m now using this timing as my gauge with the soaker hose and in essence, killing two areas in the garden at once. Got a handy tip you’d like to share? Categories: Quick Tips | Permalink.